This Easter weekend I embarked on an adventure through Death Valley National Park located just a few hours from Los Angeles, California. I loaded up my camping gear, 8 gallons of water, firewood and snacks, and set off with a good friend to explore the wilderness. We made the most of our 48 hour stay in the desert, and I thought this 2-day itinerary may be helpful if you’re ever planning a trip. The Panamint Springs campgrounds were nice, and located across the street from the General Store and Restaurant. The Restaurant has excellent beers on tap, as well as a $10 all you can eat breakfast buffet that was delicious! 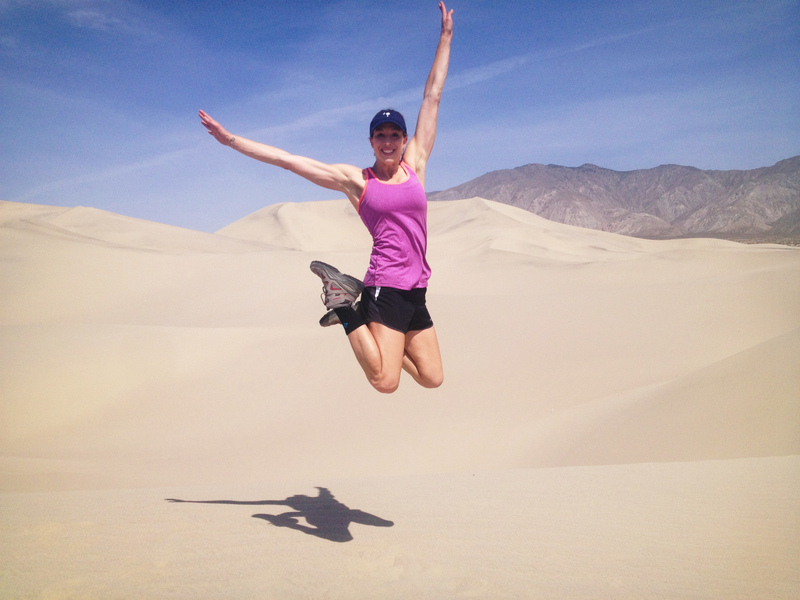 Panamint Springs Sand Dunes – if you want to avoid the crowds at Mesquite Sand Dunes, and love to hike, I recommend the Panamint Dunes. It’s a 4-mile one way trek through the hot desert sun, but the dunes are practically untouched. We did not see a single soul all morning, other than another set of footprints that had faded away with time. To get to the dunes, take the 190 East towards Stovepipe Wells Village. The turn off to a dirt road is approximately 5 miles from Panamint Springs, just passed Panamint Valley Road, but it’s really easy to miss! I believe it was just before mile marker 63. If you get to the mountain range, you’ve gone too far. We drove past it at first, but turned around and were able to locate it pretty easily. Follow the dirt road for approximately 5 miles and park in the designated parking lot. I recommend taking a compass or GPS as you hike as you cannot see your car once you reach the dunes. The hike itself is 4-miles to the dunes and slightly uphill, but we made the trip to the dunes and back in just under 4 hours. Scotty’s Castle – from Panamint, it took us just under two hours to drive to Scotty’s Castle. The grounds are free to explore, but the only way to see the interior of the castle is via a ranger-guided tour. They have a variety of tours throughout the day, and reservations are strongly recommended. Because we were visiting on a holiday weekend, all of the tours were sold out, but we still spent a couple of hours walking around and enjoying the property grounds. It’s also a perfect place for a picnic lunch as it’s one of the only areas with green grass and trees for shade! 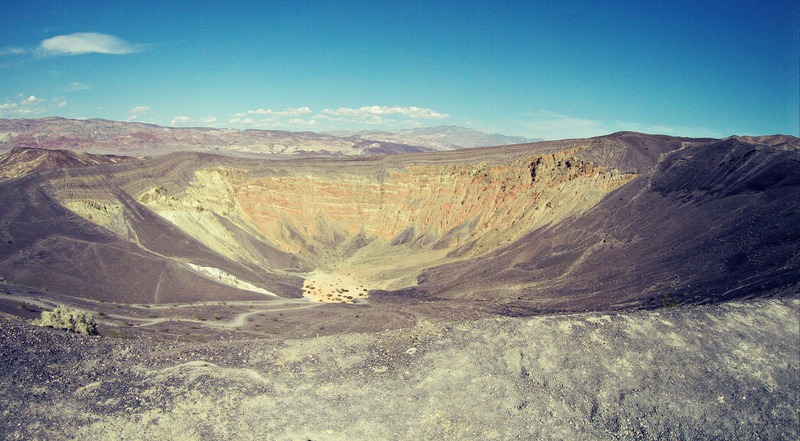 Ubehebe Crater – About 9 miles west of Scotty’s Castle lies the Ubehebe Crater. An enormous volcanic steam explosion thousands of years ago created this 600-ft deep and a half mile across crater. If you have time, take a walk around the rim of the crater, or hike down to its lowest point. The walk around the rim of the crater is about 1 ½ miles – and extremely windy! But it’s an amazing phenomenon of nature that should not be missed if you’re in the region. Artist’s Drive – Artist’s Palette and Artist’s Drive is about 40-miles east of Stovepipe Village towards Badwater Basin. This 9-mile drive winds around and up and over a palette of colorful rocks. 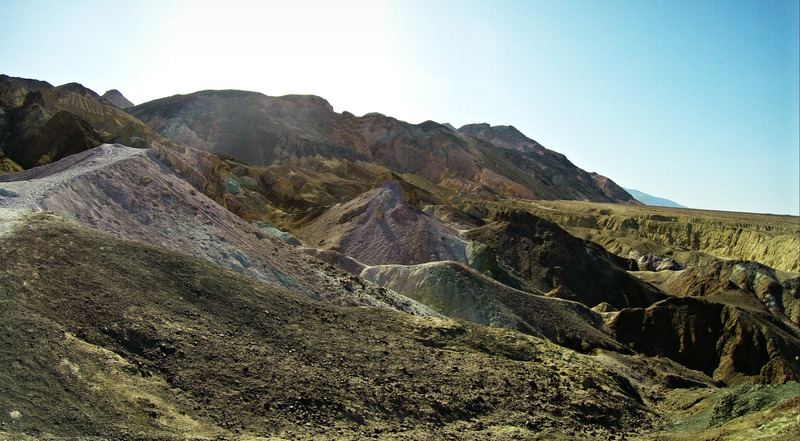 It’s linked to one of Death Valley’s most violently explosive volcanic periods, and the breakdown of various mineral pigments (Iron, Aluminum, Magnesium, and Titanium) has colored the volcanic deposits over time. The colors include pink, yellow, green, and purple. Three are many paths and hills to explore, so be sure to park and walk around the colorful rocks. 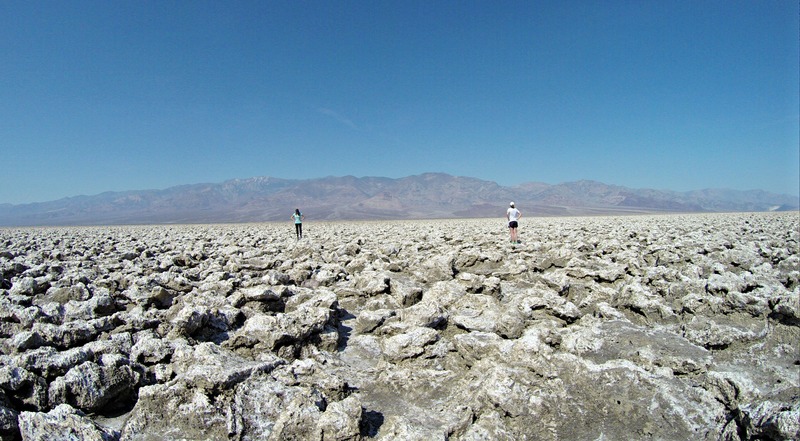 Devil’s Golf Course – Once back on Badwater Road, it’s a short 8 mile drive to another unbelievable Death Valley must-see. 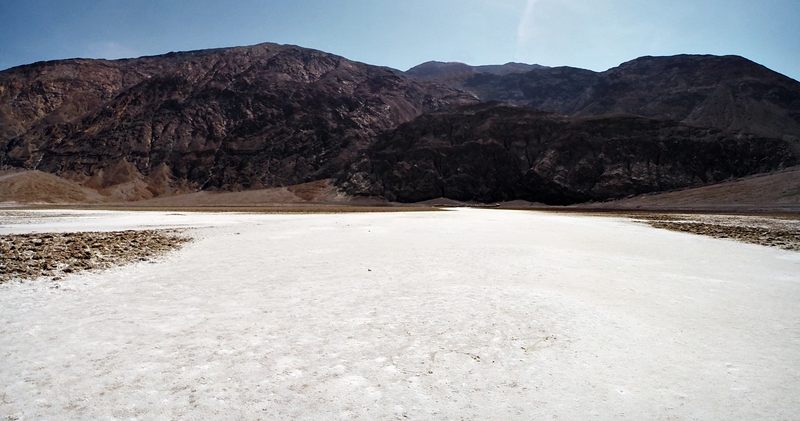 The Devil’s Golf Course was my favorite attraction that we visited in Death Valley. To get there you have to take a ½ mile drive down a dirt road, but it is easily accessible in most cars. The “golf course” is made up of large salt formations that stretch as far as the eye can see (approximately 40 miles via Google). It’s essentially a dried up lake bed that resulted in dissolved minerals, which have formed into amazing shapes during the weathering process over thousands of years. Wind and rain are continually sculpting the salty pinnacles, and they report that the pinnacles grow as little as an inch in 35 years. So fascinating! Badwater Basin – From the Devil’s Golf Course, we continued on Badwater Road to our final Death Valley destination, Badwater Basin. This is the lowest point in North America, measuring at 282 ft. below sea level. From a distance, it looks a lot like snow (and it sounds like you’re walking through snow too!) But, it’s salt, leftover salt from evaporated water. Significant rain storms flood the valley bottom periodically, but it doesn’t last long. It has one of the highest evaporation rates in the country. When the basin is flooded, the salt dissolves and becomes salt crystals as the water evaporates. 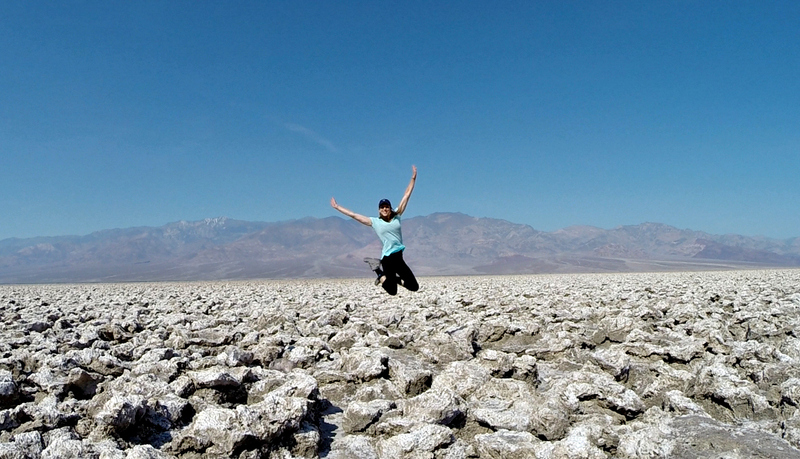 I was actually a little disappointed with the conditions at Badwater. Because it is one of the more popular tourist destinations, there are footprints that cover most of the basin, and even worse, graffiti. We saw park rangers trying to clean up tire marks on a portion of the basin, and it looked like people tried to dig holes in the salt, looking for water below the surface. 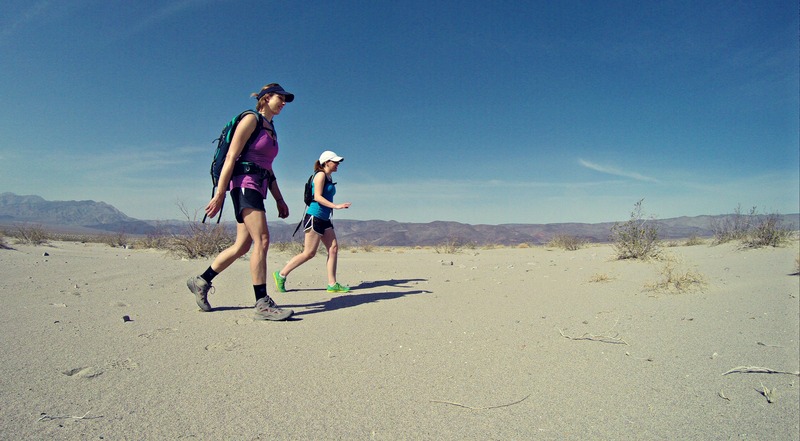 After leaving Badwater Basin, we headed towards Baker and onto our final destination, Los Angeles. 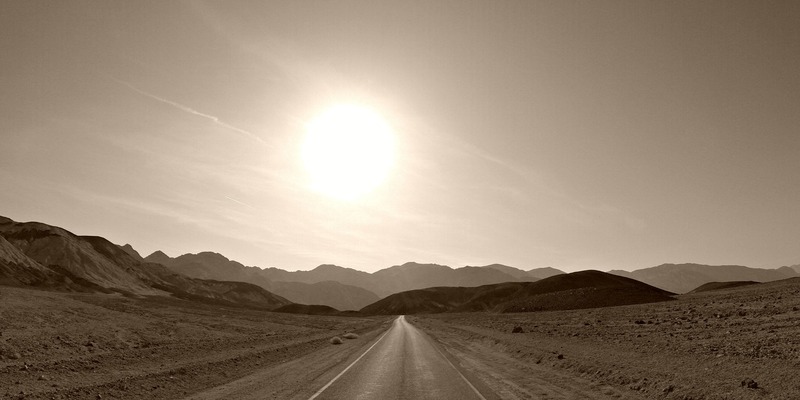 It took us about 5 hours to travel back to LA from Badwater, a little bit longer than our original route from Los Angeles to Panamint Springs. 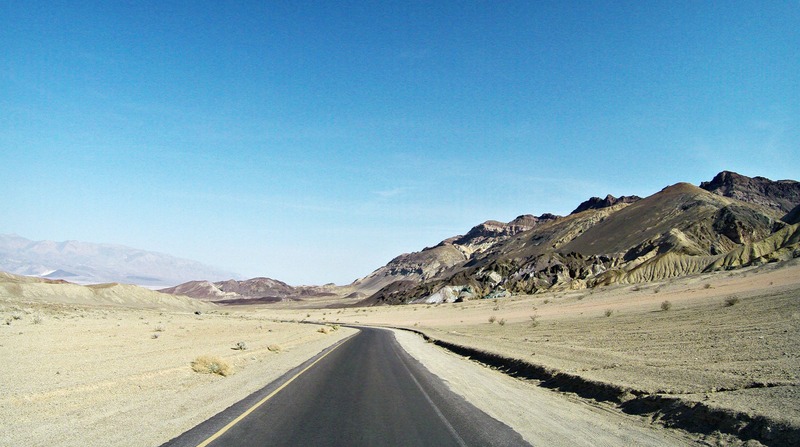 I hope this 2-day itinerary proves helpful to your future Death Valley adventures! Don’t forget lots of water!!! Happy jumping.